Back in the day of film photography, there was something called a contact sheet. A contact sheet was a single print of everything on a roll of film. In the age of digital photography, Windows 10 makes it easy to print a “contact” sheet of thumbnails of all pictures in a folder. And it’s really easy to do. With its default settings you can print 35 thumbnails on a single sheet of standard size printer paper — which in the USA is 8.5 inches by 11.0 inches. 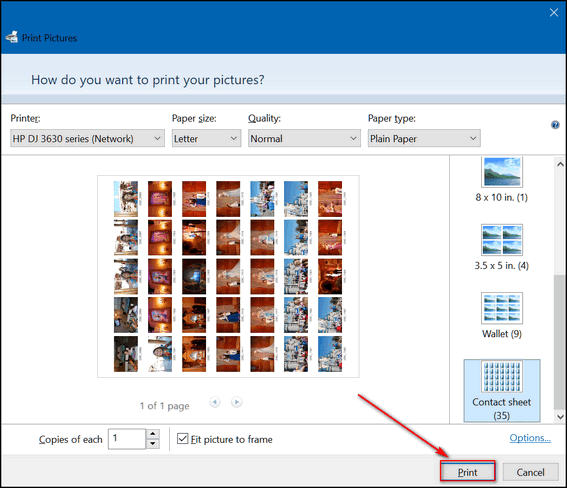 If you have more than 35 pictures in a folder, it will print them on another sheet of paper. For instance, if you have 100 pictures in a folder, 35 thumbnails will be printed on the first piece of paper, 35 on the second and 30 on the third. Open the folder which contains the pictures you want to use to make your contact sheet. Select the pictures you want to be on the contact sheet. If you want all the pictures in a folder, select one picture then press CTRL+A. 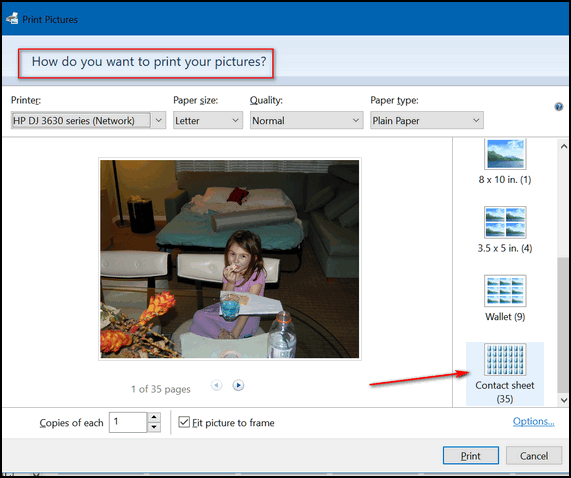 The Print Pictures dialog will open. Your printer will be selected. You can choose Paper size, Quality, and Paper type. The defaults on this computer are “Letter” for the size, “Normal” for the quality and “Plain paper” for the paper type . You can adjust these to your specs. When you click the “Contact sheet” icon you’ll see a preview of your contact sheet appear in the window. This is a preview of the first page of thumbnails. For this tutorial I chose 35 images in a folder… that is one printed sheet. Choose the number of copies of the contact sheet you want to make and click the “Print” button to print your contact sheet. Very nice and useful if you have a small batch of photos. Problematic if you have 100’s…but then if you have 100’s, it could be a good idea to spring clean: delete and organize. This is all very well but can somebody please tell me how to create thumbnails? I have a few gmail icons on my desktop that I want to change to photos. Icons are already special kinds of images… but their special types of images with an .ico file type – each icon contains several images of different sizes. This tip was not about printing thumbnails of icons, this was a tip about printing a folder of standard images (for example .jpg, .png, .gif images types). 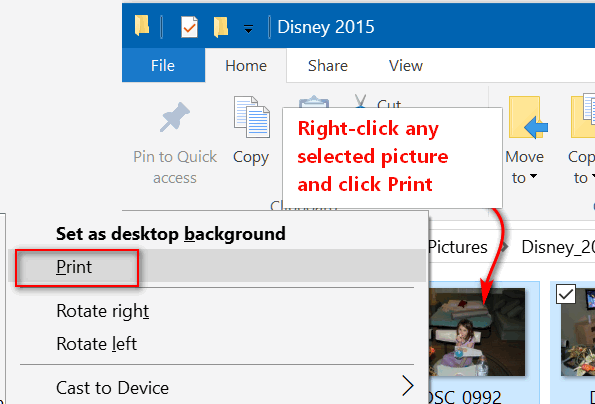 File Explorer will automatically show thumbnails of these types images unless you change the default settings. Icons are a whole different animal. Can I do this with windows 8.x? It works with Windows 7, Windows 8, Windows 8.1 and any version of Windows 10. I like that, but since the 1809 update, my computer won’t show the pictures in a file. I tried making the Pictures a default , but it didn’t work. Easy fix… Open-File Explorer. Click on “View”, click on Options > Change folder and search options. In Change folder and search options, click the view tab and uncheck “Always show icons, never thumbnails”.